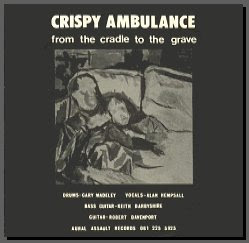 In preparation for this post I decided to Google search for the cover image because I am too lazy to scan it myself when I stumbled across the Crispy Ambulance official website and realized they have many of their songs available for download as 30 second sample clips. So if you like this single head over to "http://www.crispyambulance.com/recordings" and sample some more tunes for free. No description is coming from me today regarding this single other than saying it is moody English dark wave from the early 80's ...I told you I was lazy. Dave G.